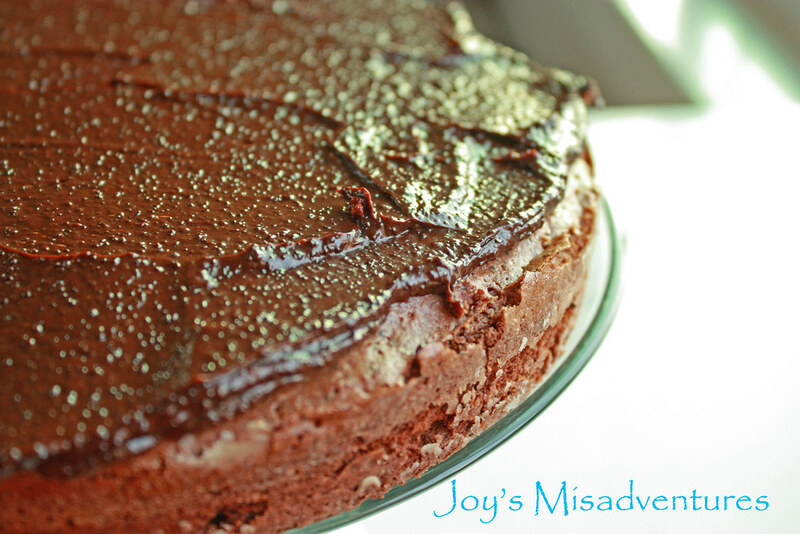 Joy's Misadventures: Baking Partners – Happy Birthday Julia! Baking Partners – Happy Birthday Julia! Welcome to my first attempt to a Baking Partners challenge. 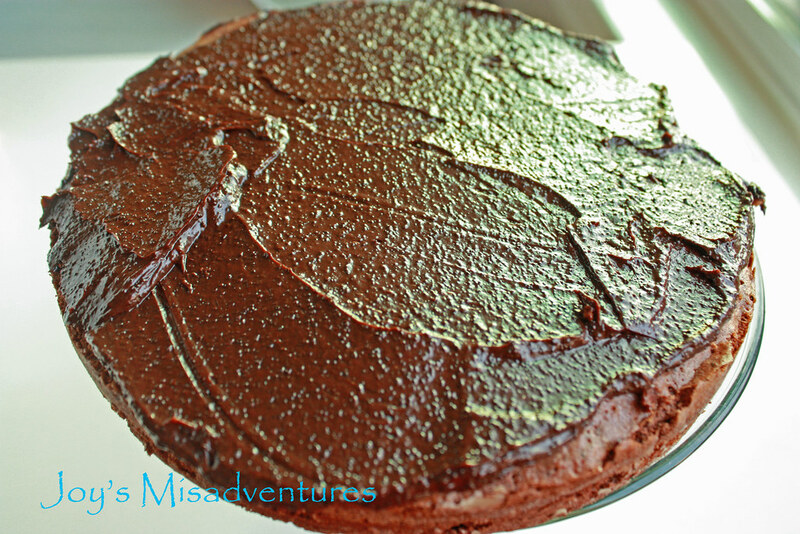 On this episode we will be making Julia Child’s Reine de Saba avec Glacage au Chocolat: Chocolate Almond Cake. Preheat oven to 350F/180 C.
Prepare the cake pan with flour and butter. Melt the chocolate in a double boiler (or large bowl over a pot of simmering water) with the coffee. Once the chocolate is melted, remove from the heat. In a separate bowl, cream the butter and sugar together until the mixture becomes fluffy and pale yellow. Add the egg yolks and mix until it is well incorporated. In yet another bowl, whip at a medium speed the egg whites and salt until soft peaks are formed - accelerating the speed slowly. Gradually add the sugar and whip until the egg whites become stiff peaks. Set the bowl aside. Take the egg yolk mixture and fold in the melted chocolate mixture. Mix in the grounded almonds and almond extract. Take ¼ of the egg whites and fold it in batter to lighten it up. Fold in another 1/3 of the egg whites then 1/3 of the flour. Alternate the egg whites and flour until it is completely incorporated. Pour the batter into the prepared cake pan and bake for 25 minutes or until the cake is cooked through. The center may be a little soft but a toothpick may just come out oily. Let the cake cool for 10 minutes in pan and then remove from the pan. Allow the the cake to cook for an hour to 2 to be completely cool. Fill out a bowl with water and ice. Set aside. Place the chocolate and rum/coffee into the double boiler and melt the chocolate over simmering water.. Remove from the heat and mix until the chocolate mixture is smoothe. Beat in the butter at a table spoon at a time. Place the bowl into the water/ice bath and mix until it has cooled enough to have a consistency that is spreadable. 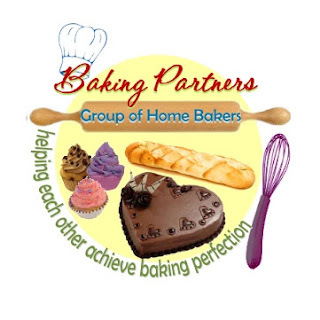 It is nice to get to know you through baking partners..
Glad to know to through Baking Parners. your cake looks awesome! May be its called a careless beuty. I like it. Simply done...but I am sure it's delicious! I didn't know you were in the group - I'm glad! Your cake turned out great! Delicious cake! Glad to know you thru the group.